I would like to write about the importance of dealing with pollution of the waters. For the church to restore it’s credibility as the voice of God, the clarity and purity of the waters have to be restored. Whenever one needs to revisit strategy for church growth, one has to rewind to a place where the early church began, and it is no coincidence that we always return to Acts 2:42 as the pattern for church growth. THERE IS PURITY AT THE SOURCE…. A good illustration is the flows of a river. 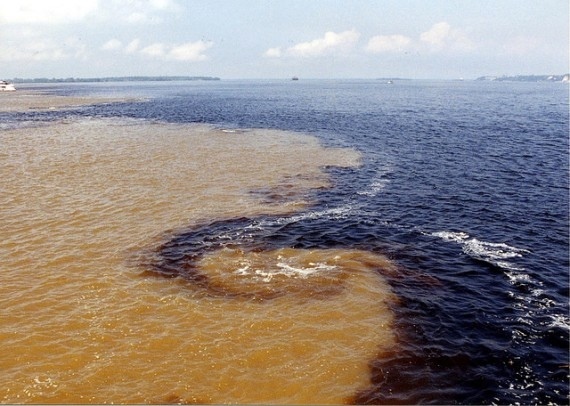 But as it flows 4080 miles through the nations of Peru, Columbia and Brazil the water begins to lose its clarity and the purity as the various nations begin to pollute it, through commercial exploitation and other activities. As it ends it’s journey 4080 miles later, it is almost unrecognizable as it flows into the Atlantic Ocean. To heal the waters, one has to return to it’s source. This is where you will find the standard….the water at it’s purest. We must be hydrologists in this season…skilled individuals who can analyze the chemical composition of water….we must be able to study water flows….we must quickly identify the threat of destruction of entire eco systems…. Water is meant to be a critical life giving resource, but in a polluted state it can destroy all living organisms…. This many be the reason why great parts of the Body of Christ are emaciated and lifeless because of water pollution. Irrespective of our experiences in our journey with God….God’s Word is settled and fixed. Any change needs to come from us. We can adjust and fine tune our revelation. We cannot reform the Word of God. It is established, fixed and settled. If we want to know the standard, get a sample from the headwaters….or from the source of the river. At it’s earliest existence, the church grew at a phenomenal rate in the absence of any technology. No mass media. No mass communication systems. Small groups met in houses. Yet their impact was amazing. If we take a close look at all the major religions of the world there is a great consensus in human values…..you study the tribes from the Incas in Peru to the aborigines in Australia….there are common values. The Greeks and the Romans and even the pagan religions advocated all these values….. However, here is ONE big difference, the early church did not just publish a manifesto of their beliefs and value systems…..they lived these highest values….this was the irresistible attraction of the early church. They manifested the very nature of Christ. This is the purest expression of Christ. We know that the whole earth is the Lord’s. He has ownership over all things. We may be forgiven for being zealous about the message that God has entrusted to us, but it is becoming abundantly clear that the Greeks and the Romans and the pagans want more than the rhetoric….they have the best of that. They want an encounter with Christ. That is the barrier of entry into any nation on the face of the earth…the check point will be scanning for the nature of Christ….this will get us into the most difficult places. The nature of Christ is irresistable in any place on the face of earth. I am fully convinced that it is at this point of entry where we will rise or fall. The sum total of the forces at work, or the combination of qualities belonging to a person. So for the nature of Christ to be manifested, all of these essential defining characteristics must work together in harmony. One of the precautions that we could take is to constantly submit our minds to the audit process of the Word of the Lord. The Lord would use His chosen vessels to reveal deficiencies in our operations. The letters to the seven churches were actually audit reports. The purpose of auditing is to give credence to our operating system. If we heed to the audit findings and implement the reform demanded, our activities will become more profitable.